If a fencer steps beyond the strips legal side boundaries, the official will award 1 meter, or approximately 3 feet, of ground to the opponent on the restart. Stepping beyond the strips rear limit results in an awarded touch to the opponent. 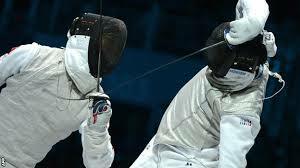 Officials may also award touches to the opponent if a fencer attacks with both hands, if a fencer doesnt obey instructions or if a fencer displays poor sportsmanship or overly violent behavior.